"Sorry, Asra. You can't play,” Nexter said, snickering along with the other neopets who had formed a group outside the Adoption House where they lived. A small patch of abandoned neopets, taking advantage of a beautiful rain free day in Meridell, had gathered outside to play a game of yooyuball. Asra, a plushie Shoyru who had been cast away after his mother had abandoned him for no good reason, decided to tag along. But he halted now as the group of five other neopets had all turned to face him. “Because you’re unconverted,” Nexter said, in a way stating the obvious. Asra noticed the looks of disgust on the others' faces. Asra glanced down at his hands and body, and then to his feet. His blue patchwork looked faded in the bright morning sun and his needlepoint was unstitching in places, but Asra had never seen a problem with his appearance before. 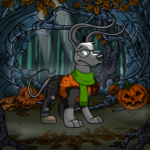 In fact, his mother used to tell him he was special and that she’d preferred him to the best painted Draik any day, which always made Asra feel better about the fact that he was never given new clothes like the rest of the other neopets. He glanced back up at Nexter. 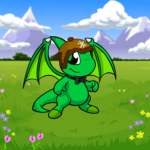 Actually, his real name was nexter_neopet_452, a name given to him by an owner who had zapped him brown, then bored, dumped the poor blumaroo into the Adoption House that served as a local Meridell Agency, hoping to find lost and deserted neopets good homes. But everyone just called him Nexter. He’d been here for the longest period of time, Asra had heard. In fact, the Adoption House was hosting its annual Adoption Day Fair, where most of Neopia showed up to claim one of the potential pets. Every last one of the pets was secretly ecstatic about the prospect, but none wanted to show too much hope since it was never a given that they would find a new family. “So?” Asra said, a little defensively. “So,” piped up one of the other neopets, this one a female, orange painted Aisha by the name of 34wenzel_cart93455 (wenzel for short), “You can’t wear the your team’s jersey like us.” She flared out her chest and only then did Asra notice two of them were wearing Terror Mountain yooyuball team jerseys, while the other three sported Meridell jerseys. The two boys wearing Terror Mountain jerseys exchanged glances. One, a ghost Gelert named hallowman930 (Hallow for short), the other, a pink (yes, pink, such a cruel owner!) Grarrl christened BloydLazarusDa1st (known to all as Bloyd). Almost forgetting, Asra remembered that Miss Mickensy , the wizened Acara who presided over the Adoption House was a stickler for safety and rules. And Bloyd was right, he wouldn’t be able to wear the helmet. “It’s alright,” he said, trying to keep his voice good humored. The other neopets laughed together, then turned and ran to the field to begin their game. Asra stood there a few minutes longer watching them. He had never thought much before about what it would be like to be a converted pet. Sure, he had admired their shirts from time to time. Had slightly envied their jackets in the wintertime, but he always concluded it was just the way life was. There was no way he would be able to be a converted pet, so he made the best out of not being one, and it had always worked for him. Turning at the sound of a voice, Asra saw the newest neopet to reside at the Adoption House. He was well named, Jpeg, but he was a basic colored blue Korbat, with pretty outstanding Battledome stats. Most of the other neopets tended to shun new additions, but Asra felt a sort of instant connection to him, like they were both outsiders just trying to fit in. He sighed, but plastered a smile on his face, despite his dejected spirit. “Want to go for a walk?” J suggested. And the two of them fell in step together walking around the field towards the nearby pond. They had reached the lake, and approached the old wishing well that rooted itself near the shore. The stones were mossy, the wood molded, but it had somehow managed to stay upright. There was a rumor that it was magical, and that sometimes, if you donated money to its watery depths, it would grant you one wish of infinite possibilities. That thought struck an idea in Asra’s mind. He walked to its edge and peered down. The cylinder funneled down so far that Asra and J could only see several feet, until the darkness swallowed the remaining space. J flicked a pebble and they both watched it float effortlessly into the blackness. It was there a few seconds before disappearing completely. They waited to hear the splash and ripple of water down below, or perhaps the growl of some angry beast as he was disturbed from his slumber, but they heard nothing except silence. Asra reached into his side pocket, the one his mother had stitched for him just a few days before they parted. ‘Now you can have some place to store things, just like the other pets, Asra. Who needs pants anyway,’ she had said, smiling down at him. He pulled out a small acko piggy bank and wiggled it, hearing the contents inside rattle. He’d only managed to save up about 17 neopoints in his entire life. He’d been tempted to buy many things, but decided to save up for a gift he would present to his mother when she came back to get him. He realized for the first time how naive that sounded, and slammed the piggy bank against the side of the well in frustration, making J jump back a couple feet. “What are you doing?” J asked. “That’s ridiculous! You know this well isn’t magic. You’re wasting your savings for nothing!” J pleaded. The Shoyru ignored him, concentrating instead on repeating the phrase over and over inside his head. I wish I get adopted. I wish I get adopted. I wish I get adopted. He parted his hands, keeping his eyes closed. J watched them gleam momentarily reflecting sunlight, some bouncing off the sides of the well, before they were gone. Asra listened for any sound, but none came. It was if the coins had never existed. That when he felt them slide from his hands, that they had simply disappeared, become dust and been blown away by the wind. If J had not witnessed them falling into the well, Asra would swear to that story instead. He repeated the phrase one more time for emphasis. Both neopets waited for something, although Asra was not sure of what. A voice speaking out in deep tones announcing his wish had been granted? Or maybe a strong wind gush to signal his wish had been heard. Nothing. The well remained dingy and unextraordinary. “Maybe it takes time to work?” J suggested, trying to be helpful. “Never mind.” Asra turned sorrowfully. He started walking back towards the Adoption House, J by his side, feeling that his life really couldn’t get much worse. Wanna stay at home today? It's a question that is long overdue. Pancakes or Waffles? Yeah, that's right. The PIZZA.